When screen first comes up, Location information will be red. It will remain red until the GPS Sensor in your phone receives GPS data. This could take up to a minute. When it receives information, the location information will turn lime-green. Wait a bit more to see if the information turns darker green that indicates the accuracy has improved to below 10m (meters). Press Split to set Start Location and start timing a Split. As you move, the distance from the Start Location will be displayed on the progress bar. When you have traveled the Split Distance (default 500m), a new Split will be created for you and timing will start for that Split. After the last Split in the run, Long Press Split to stop timing. Press Split again to set a new Start Location and start timing the next Split. Press a Split in the list to Delete a Split, or change the Name, Description or Start Time. In the Split scroll list on the screen, you will see the previous Splits. Each Split in the list shows the Split Number, Start Time, End Time, Split Distance, Actual Distance (if applicable), Elapsed Time, and Normalized Time. Normalized Time is the time it would've taken to go the Split Distance at the rate recorded in the Elapsed Time for the Actual Distance. Press Save at any time to save data to that point, otherwise data will be automatically saved when you leave the screen. 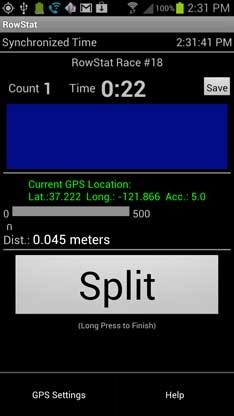 Press Menu to bring up the GPS Settings dialog which will let you set the Split Distance and turn the GPS Sensor off or on. When not using your GPS feature conserve battery power by turning off the GPS in your settings.